Open Wings families have shared their amazing stories of transformation. It’s humbling for us, to be honest, but we are proud to have played a role in helping so many children find their voices and find their place in the world. We look forward to adding more stories here for years to come. Open Wings has become all that we dreamed it would be when Ainsley was a little girl playing with her toys on the floor. Little did she know I was studying her learning and thinking of how we could build a school that would support all kinds of kids learning in all kinds of different ways. Ainsley played with her toys with all of the curiosity one would expect to see in any child. So many aspects of her early development were like other children… and, yet, other aspects were very different. I knew she would not be able to learn and grow at her own pace in other, more typical learning settings. But, where could she go to school? Where would her individuality be nurtured? Where would she be safe? Who would challenge her to press ahead while respecting her quirky nervous system and anxiety? Who would tell her to reach for the stars and sincerely believe she actually could do it? In 2012 Open Wings was born! Our hope was to build the school that could do all of these things for Ainsley and for the many other children on unique learning journeys. We believe Open Wings has been the answer to many parents’ prayers. We have seen our school support significant growth in each student. As parents, we are very proud of Ainsley and the evidence of deep learning she shows us every day. Ainsley has grown from a 5 year-old little girl with a big bow to a tall and more independent 10 year old. We see her growing up and soaring into her own unique and special personhood. 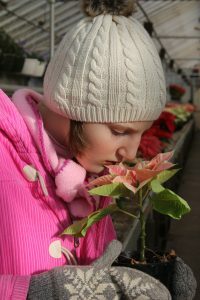 Autism does not define her… the word is rarely ever spoken any more… Instead, she is defined as an artist, a lover of music, and horse girl. She is a friend and a sister. She is a daughter and granddaughter… She is so much more than a label. We know her learning profile so much better and the team responds to her as a unique learner. She thrives when her learning is supported visually and when she can draw. She loves to read about animals and can remember anything sung to her. We know she loves to learn and she works for long periods of focused time because of the scaffolds her teachers provide for her. Ainsley loves school and wants to go every morning. She truly wants to learn and be in community. She loves her friends and learns so much by observing them. Her friends value her as unique and her own person. Ainsley is safe… as a parent, knowing your vulnerable child is safe emotionally helps you sleep at night. Ainsley is known. People study her to figure out how to teach her next, not to critique her. At Open Wings, people listen to Ainsley. When a child struggles to turn her thoughts into words, this is so very important. Getting a sentence out is sometimes such a victory for some kids that to know that the sentence will be heard in a world that moves so fast is immeasurably valuable. We are grateful that the Open Wings team hears our daughter and validates her voice. Ainsley skips into school with a smile on her face. Thank you for helping Ainsley and all the children at Open Wings to Soar into a future that could very well be beyond their grasp if not for the deliberate interventions and support they are given on their learning journey. A few weeks ago, Anneliese told me that it was getting close to the 100th day of school, and so she needed to do a 100 project for school. We went to the craft store to look for ideas together. After some brainstorming, we decided to pick out beads for a necklace. She deliberated and picked out shells and blue beads so that she could have an ocean necklace like the latest Disney princess (not exactly the same, she said, but *like* Moana). We bought the supplies, and she spent a few days diligently working on her project despite a lot of interruptions from her little brothers, and then she counted down the days until she could take it to school to proudly show everyone while she encouraged Gabriel to work on his project. Anneliese is a neurotypical sibling in her second year at Open Wings, and this one experience demonstrates so much of her growth. She showed great awareness and initiative when she told me about her upcoming project. She has clearly been working on brainstorming and researching skills at school. Her creative side shined through with very little guidance from me, and then she demonstrated great focus and persistence. Finally, her confidence was strong, and she saw the opportunity to share her project with her teachers and friends as her reward. Not to mention the fact that she independently devised a pattern and counted by tens when last year her math skills still mostly consisted of counting and writing her numbers. 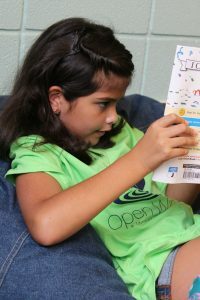 Anneliese would thrive in most any classroom, but what we see as a result of her experience at Open Wings is not just growth in her academic ability, but her ability to solve problems and share with her peers and teachers in deeper and more meaningful ways. She thrives in the small classroom setting, and her connection to her school community increases daily. Open Wings has forever changed Chase’s life and has given him the strength to grow in ways we never imagined. Since his autism diagnosis in 2012, we never really knew what the future would hold for Chase. The turning point in his development and success started when he began at Open Wings!! The school provides an incredibly safe and encouraging environment. This has allowed Chase to break down many barriers and gives him the ability to learn at his pace. We are proud of his accomplishments in social skills and educational advancement. It is so cool to see him reading, writing and using his fine-tuned math skills. He would not be where he is today without the incredible teachers and staff at Open Wings. The school provides an entirely new world for Chase to experience. We have a great comfort level dropping Chase off at school each morning, knowing that he will learn something every day that can be used to open new doors in life. The ultimate compliment to any school is to feel the confidence that your child is in great hands. Since day one, when we took Chase to school we left him, with no anxiety or worry… and the confidence that everyone at Open Wings encouraged “Chase to be Chase”, supported him every minute of every day, was committed to his learning and development… and most of all he was loved. We thank everyone at Open Wings for their tremendous Encouragement, Support, Commitment and Love for Chase. Thanks for everything you do for him and our family!! Gabriel loves stories. Not just reading stories or having someone read to him, but all of the elements that make up stories. Maybe he loves villains a little too much, but he wants to know what happens to characters and what happened prior to the start of the story. He finds the parts that are scary or exciting or funny and relives them, acting them out or talking about them endlessly. He finds out about a place or a time in history and wants to know about it. He reads a word he doesn’t know and wants to learn its meaning and how to spell it. He also loves to write his own stories and tell us about them. He loves to create characters with ridiculously complex names. That Gabriel loves stories is remarkable progress, considering how when he started at Open Wings four years ago, he couldn’t sit for any story at all. But these days the most interesting story is the story of his life at Open Wings. For so long, years really, Gabriel couldn’t or wouldn’t tell us anything at all about his days at school. What he was learning and doing in reading or math. His interest in social studies, especially geography. How he actually enjoys science or art, when he wouldn’t even participate in them at all his first couple of years at Open Wings. His interactions with peers, his desire for social activity. What he sees on field trips and hears from classroom visitors. What he’s excited or worried about. Now we can ask him questions and get answers, even if they are a little far-fetched at times. All of this conversation is now possible because of the longstanding commitment and patience of the teachers and therapists at Open Wings. Don’t believe Gabriel when he says he’s the villain; he’s a hero for coming so far, and Open Wings is his magic. Our daughter Hallie is 9 years old, and shortly after birth she suffered from a series of seizures that resulted in a brain injury in her frontal occipital lobe (brain processer). Over the years that has been seen as a mild cognitive disability, social delays, difficulty processing basic multiple step directions, as well as ADD/ADHD symptoms. Over the last few years we were getting significantly more frustrated with her lack of progress and the lack of services the public school were able to provide even with her medical professional recommendations and diagnosis. Their stance on her situation was to wait and see and when her gap increases THEN she can receive more services. That was extremely disheartening and we felt we were failing at advocating for her. We wanted her to be seen as a WHOLE child, not just providing minimal services with very little impact. She lacked confidence and had no friends regardless of our many attempts at parent initiated play dates with families from church and school. We had prayed for years that God would help guide us in this journey and provide the resources that we were seeking for her. We were encouraged to look into Open Wings Learning Community last spring and it was the best decision we made for Hallie to date. The Staff and students accepted her as part of the family and they see her for who she really is: a kind, shy, loving little girl that just needed friends and teachers who believed she was capable of growth. She was not labeled by her diagnosis or disabilities, but as a student with untapped potential. She is now getting an educational experience that is customized for her, and she now has a confidence that we have never seen before. She initiates socially now with her peers, and has a social life that warms my heart to its fullest. Areas of weakness before are now strengths. She has grown by leaps and bounds, and I was kind of ashamed I found it hard to believe she was capable of some of the skills she has shown lately. Our daughter could barely count by 2’s and now she can count Quarters and joined the Quarter Club! I cried, literally. She needed Open Wings’ staff to bring that potential out, and I am EXTREMELY indebted to the school for investing in her. We continue to look forward to seeing Hallie grow and develop into the young lady that God created her to be, and know that Open Wings Learning Community will play a key role in that journey. My grandson is very important to me. My daughter has allowed me to be very involved in his life, something I treasure very much. He has many obstacles in his little life. He has a hard time assessing social situations and curbing his impulses. At his previous school, he had a very difficult time fitting in. On the way to school I would coach him using past situations as guidance. What to do, what not to do, how to have a friend and how to be a friend. Then I would pray all day! Asking God to place his hands on my grandson’s shoulders and guide him. Asking God to help us find a solution. But almost daily there were incidents. It was hard for him, as well as, for us. One morning he told me, “I feel sad and I don’t know why,” “I try to be good! But I can’t, I don’t know why I can’t.” Then God answered our prayers! Not the answer I was looking for but his way! She was a librarian with an awesome solution: Open Wings! We applied, it took 3 long days. Then great news, he was accepted! I thank God daily for this wonderful school and their great staff! When Henry started school this year, our family had such high hopes for him. He had been tested and it was determined to be well above grade levels in math and reading. However, only a few weeks into school our family realized how wrong we were. Henry was struggling at his public school. His teacher was quite excited to tell us that after their initial testing that Henry was at grade level. This “achievement” was due to Henry’s unwillingness to cooperate with testing. I was receiving daily updates on Henry’s conduct from the teacher or principal. It was a rare occasion that they had anything positive to say. I was called from work for emergency conferences several times per month. Eventually they wanted Henry to be placed on an IEP. Henry was becoming a depressed, withdrawn little boy. He did not have any friends at school. He made statements of feeling as if he did not fit in and not being able to be “good” all day at school despite trying. It was heart breaking to watch this happen to my son. Henry was rapidly becoming that weird kid at school who misbehaved. One of the teachers at his school took a special interest in Henry. As she spent time with Henry, she encouraged me to send him to Open Wings. Finally, after much consideration, my family decided that Henry NEEDED Open Wings. We toured the school and Henry shadowed the class. We applied and luckily he was accepted. Since starting at Open Wings four months ago, Henry is a new child. He loves school, even becoming upset when his Grandmother mentioned a possible snow day. He is always smiling now. There is no more arguing to get him ready for school. He says he loves school. He has many friends and feels accepted at Open Wings. His happiness with being at Open Wings has spilled over into all aspects of our lives. Henry’s behavior has improved dramatically since going to Open Wings. While he struggled to conform to his public school classroom, Open Wings embraces his differences. They allow him the breaks he needs and help him self-sooth when his anxiety and frustration overwhelm him. The older children model appropriate handling of these situations as well which allows Henry to see his friends behave appropriately. Henry wants to be like his friends and so he imitates them. This teaches him alternative coping skills without being told how to act by adults. It is wonderful to have our “new Henry.” Because he’s so happy and feels accepted, he is a joy to be around. Open Wings has been a miracle for our family. Five years ago, we saw a noted neurologist in San Francisco who was a pioneer in the science of measuring the electrical currents generated by brain activity to profile a person’s cognitive and language capabilities. After a series of tests, we were told that Josh’s brain signatures match that of a child with “normal” language capabilities. We were quite surprised (actually pleased) because he was clearly language-challenged. It was with that promise that we believe Josh will eventually pull through. The doctor did not give us false hope. He was very clear in making sure we understand the challenge ahead. He explained that language is by far the most complex of all the processes the brain performs. It’s contextual, and experiential. It’s the process that requires the most extensive of neural connections. Josh’s condition impedes language development in multiple different ways. It’s not going to be a cake walk, we were told. Fast forward, we are still on this difficult journey. Open Wings has done wonders for Josh by providing a rich venue for language stimulation through peer interaction and self-expression. He’s always been able to ask what he wants, particularly the basics: a drink (juice-cold), what he likes to eat (nuggets), how he wants it (hot), and where (by the computer). In Open Wings, his growth has been exponential. We’ve seen a proliferation of words and phrases, some of them figurative to describe the weather, the night sky, events, and all things other than food and his physical needs. He negotiates the duration of his WII games with Mom or where he wants to spend vacation (Disney Cruise!). At home, he expresses preference on who should read or do math with him (Dad!). At school “only Mr. Sneeberger will do math with Josh”, he tells his mom. The other night, something happened that I believe we just turned a corner in Josh’s labyrinthine journey through language. He came rushing to me atop his hover-board, pointing to his now missing right canine tooth. “No more loose tooth!“ He said excitedly. “It dropped straight on the white sink!” Pointing to the bathroom upstairs. “Big boy teeth will grow.. straight, and flat! Strong teeth”, clinching his fist, flexing his arm. It was too cute! Open Wings Learning Community is an amazing school. Their approach to learning is second to none. This school is a perfect fit for my Grandson Logan and has been instrumental in his learning achievements. This is Logan’s first year at Open Wings Learning Community and his academic results have far exceeded my expectations. His literary and mathematical skills are rapidly progressing, as well as his needed life skills. The multiple field trips that this school offers the students, are always educational and in many instances, they relate directly to our own community. This has afforded Logan the opportunity to learn outside the classroom, to learn subjects such as agriculture, farming, the arts, history, science and trades that are lost to our history. The staff of Open Wings Learning Community is exceptional, they use innovative ways to address each student’s individual needs. Through a personalized educational plan and a positive environment, this school is able to achieve success; where all other learning institutions fail. Open Wings Learning Community has created a positive educational future for my Grandson Logan, a future that could not be realized in any other learning institutions within our community. We chose Open Wings largely for the fact that our son would get so much one on one attention. He is not a typical learner and we were afraid he would get lost in the shuffle in the traditional school setting (literally and figuratively). Our son Maddux has autism. For him so many things the rest of us take for granted are a daily struggle. There are behavioral challenges. Speech and socialization don’t come naturally for him. With that, it has been difficult for him to show interest or just be involved in everyday life. This is our third year at Open Wings. It is a great time for us to stop and look at all the progress he is making. He continues to grow both academically and socially. Academically he is working on reading and writing. He has mastered several sight words and is building up to reading short sentences. He is now independently able to write a short sentence as well. We are very excited about the possibilities of reading and writing in the hope of opening up more lines of communication with him. Maddux is also working on addition and writing his numbers. His favorite subject is probably art. He loves to paint and enjoys the many projects they work on. As parents, we love to be on the receiving end of these special projects. Socially Maddux is not only participating more with his friends, he is now initiating interactions. This is a huge gain. He has gone from not being involved at all to seeking out the attention of his friends and teachers. Our goals for our son are no different than those of any typical 8-year-old boy. Our path is longer and certainly slower but with the help of Open Wings we are making progress. 11 years ago, a child was born in Central America with an uncertain future. At 7 months, she arrived in the United States. Her weight did not place her on the typically used pediatric growth chart. The love of family and educators has helped her to grow and flourish since that time. It was her Pre-School Teacher who noticed her brief daily seizures. It was a Kindergarten Teacher who suggested she be tested for ADHD. And now, a team of committed, talented, patient educators at Open Wings Learning Community help her daily reach her goals in reading, math, science, foreign language, community awareness and social skills. She is treated with respect by educators and students. Everyone she encounters in a day maximizes on her strengths. She happens to be a hard worker with a magnetic personality. This amazing teaching environment would explain why she wants to attend school 7 days a week. So tonight, her future becomes more and more certain with every person who contributes to her school. Thank you for your commitment to early education. Thank you for the gift you create by giving her an exceptional childhood. Thank you from Maria, who plans to “SOAR” with your help. My son’s name is Mikey he is 12 years old. He is his second year at Open Wings. I don’t know where we would be if I didn’t find this wonderful school. I was told when he was in second grade that he would never read, and that it was ok that you couldn’t read his handwriting. His teacher said that everything would be on computers, so the fact that he couldn’t spell didn’t matter. I was told that he wasn’t trying, and that I didn’t push him hard enough. Not all kids learn in a typical way. Some just need to be taught in a different way. There are no words that can express how proud I am of him for never giving up. He has come so far in the last year. He is reading, writing, and learning to express himself. He loves going to school and is happy to be there. Before Naomi was a member of Open Wings she was very shy and kept distance from other students and kids which often caused her to be picked on or made fun of. Since joining Open Wings we have seen a complete 360. She is outgoing and protective of other kids, she tends to lead with encouragement and beautiful smile. She has learned to keep great positive thoughts as well as learned to appreciate herself more and understands how special and talented she truly is. She is always there when someone is upset or sad and does her best to cheer someone up. She has always been talented and gifted in our eyes but Open Wings has shown her how to blossom in every one else’s eyes to show how talented and gifted she is because of the confidence she has gained while attending Open Wings. Naomi is a girl of beauty, talent and heart. Making the decision to send her to Open Wings has been by far one of the best things we have done for her in order to give her what she needed to grow and truly find love in herself and confidence to become the girl who has been there but afraid to come out. They just have the keys she needed to unlock it. Naomi loves the school the teachers and all her classmates. If it weren’t for Open Wings I’m not sure we would be seeing the girl we see before us now and for that my family and I thank you, Open Wings, for giving our daughter the tools needed to become more amazing than she already was. Sam has brought home some challenging math work and was really enjoying the difficulty level. He has been eager to stretch his wings and discover things while in his comfort level. Open Wings teachers work hard to move at his pace so that he is challenged but not frustrated. This is so important, because Sam is a smart kid and needs challenging work to feel confident. Sam is also my “deep thinker,” so he needs to consider all aspects of an activity before comfortably participating. The teachers have worked with him on that, respecting his need to understand everything before moving on. Sam really appreciates their understanding, and is very comfortable with them! He loved all the Valentine’s Day events, telling me about all the activities they did, including the crafts which are not normally his favorite. Like Thomas he enjoys going to school, and mornings have been very easy. New routines and new people can be a uncomfortable for him, but he’s meeting the school days with excitement. He REALLY likes Open Wings, and that’s a big deal! Through Open Wings, Sam is developing a strong sense of self so that he can know and develop what God has given him! I love watching him learn and grow in this amazing school! I’m enjoying the way Thomas has responded to Open Wings. He is playing more actively with the neighbor kids, and just might feel a bit less dependent on his video game for entertainment. He loves making new friends, and he tells me all about his classmates. I’m hearing more laughter as we play games or do things together. A few nights ago we had some friends over for dinner, and he performed a comedian act with an alligator puppet, telling jokes and laughing hard at them. It was a big hit! I haven’t seen him that eager to put on a show before! There was much joy, and I think he’ll continue to try out different ways of performing for others. Thomas loves going to school, getting out the door with very little effort. I can tell he’s excited to learn in science, write about his experiences and peruse through his books. I’m seeing more curiosity and hearing a lot more questions! He seems very happy just being himself in his school community. I’ve always wanted Thomas to understand the ways God made him special, and Open Wings is partnering with us to make sure that Thomas knows his true gifts and potential!